Almost every driver may receive a traffic ticket at some point in their driving tenure. Traffic tickets can range from relatively minor to extremely serious, though even the most seemingly minor tickets may have surprising consequences. An experienced traffic attorney can help to limit or even eliminate the penalties you may face for a traffic violation. If you have received a traffic ticket in St. Louis or St. Charles, do not hesitate to call the Law Offices of Kenneth P. Carp at (636) 947-3600 for assistance. In addition to state traffic laws, all holders of commercial driver’s licenses (CDLs) must additionally comply with regulations set out by the Federal Motor Carrier Safety Administration (FMCSA). The most common penalty for a Missouri traffic violation is a court-imposed fine. Many people opt to simply pay the fine and move on with their lives. However, when you pay the fine for a traffic ticket, you are pleading guilty to the underlying traffic violation. This means that the offense will go on your traffic record and the Department of Revenue (DOR) will assign a certain number of “points” to your driver’s license. While these points may not seem like a serious matter, having points on your license may create additional consequences. For example, your insurance rates may go up or you may not qualify for certain jobs that require you to have a clean driving record. Furthermore, if you accumulate a certain number of points in a period of time, the DOR may suspend or revoke your driver’s license. More serious traffic offenses, such as DUI/DWI or leaving the scene of an accident, carry more severe penalties including probation, loss of driving privileges, and even potential jail time. Additionally, if you fail to show up to a court date for even the most minor traffic violation, the court may suspend your driver’s license and may issue a warrant for your immediate arrest. An experienced traffic attorney will represent you in court so that you do not have to be concerned about missing a court date, and will know how to negotiate with prosecutors to have your traffic ticket reduced to a lesser violation to avoid any points on your license. In many cases, an attorney may be able to have your ticket completely dismissed. If you believe you were wrongfully accused, a lawyer can aggressively defend you at trial to contest the violation. 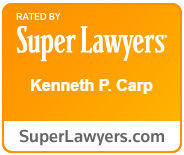 At the Law Offices of Kenneth P. Carp, we have extensive experience helping St. Louis and St. Charles drivers with traffic matters. If you have received any type of traffic violation, call our office today at (636) 947-3600 for a free consultation.